Strut’s advocacy across this series is commendable. I’ve always wondered whether the influence of European music upon African musicians is really such a one-way street. 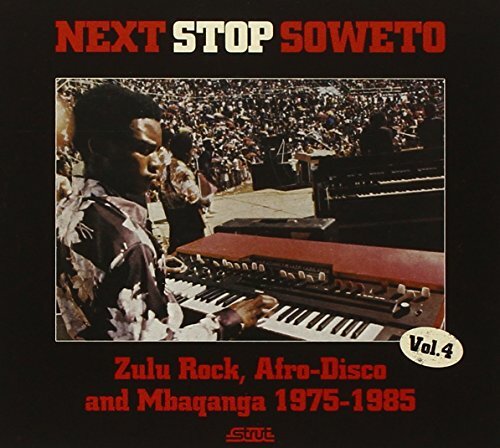 Before the advent of the internet, there was a proliferation of bootlegged cassette tapes being swapped and traded in African marketplaces, and this accounts for many of the influences heard on Next Stop Soweto 4, spanning recordings between 1975-1985. It must also be true though that the rhythmic component of african music cross-pollinated with western funk, soul and disco. We’re such an ethnocentric lot. We want to believe all the genius evolved in the first world. Still, if you were not told the title of this album, or the origin of its music, some of the tracks might just have easily have come from Philadelphia, Memphis, or New York. Harari’s disco-gospel call and response number ‘Give’ is a stonkingly impressive dancefloor hit, in the ‘You Make Me Feel (Mighty Real)’ sense. Almon Memela’s ‘The Things We Do in Soweto’ has a funky bassline and wah-wah guitar befitting inclusion on Curtis Mayfield’s Superfly. The Drive’s ‘Aint Sitting Down Doin’ Nothing’ also has that blaxploitation sound, but with a much heavier jazz foundation. Isaac’s ‘Get Down’ does exactly that, and its the best song Donna Summer never performed. Xoliso’s ‘Manano’ has a prog-rock opening stanza that sounds like its lifted from a Soft Machine record, but progresses into something more afro-rock. Elsewhere, the sounds are more typically ethnically related to African music, as we hear it. Another great addition to the series.